ow often is austerity on anyone's mind? Perhaps never, maybe once or twice if you're thinking something ill about a distant relation. The Formless: exactingly handcrafted bricks of the uncanny, punk style. But austerity's not all bad, and while I've long been a proponent of its more esoteric applications, I think Brenden Clenaghen may just be Portland's austerity king. In addition to being a hyper-formalist conceptual painter (his obsessively crafted works have a humor and sensuality in stark contrast with their exacting production methods), he's half of the duo The Formless. 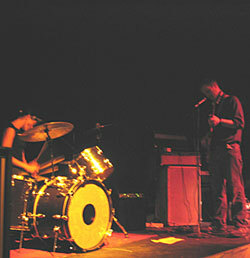 The band pummeled a hot August Thursday night into abject submission at Million in North Portland. 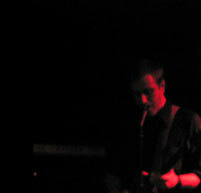 As a super-indie all ages club, Million is in itself quite austere  your basic black box with a bench against the wall. No smoking, no drinking, not even water for sale, as far as I could tell. Brenden Clenaghen: working-class black and an iconoclast's measured gaze. This might not have been a bad idea in this case, however. Ears might bleed if found too close to the stentorian aggro-Goth punk coolly stamped out like so many sheets of molten metal by The Formless, more like godheadSilo than The White Stripes. Clenaghen plays a severely overdriven Gibson at 'cuda-speed through dark melodies and cyclic anti-surf riffs while barking things into the microphone that sound at best discontented. And when he wants to show his cards a bit, his guitar makes sounds like a laser through metal. 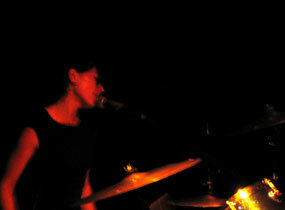 Chelsea Mosher: a math-Neanderthal with drumsticks and more gallop than groove. Meanwhile, Mosher's drums are literally pounded across the floor by her punishing attack. Her lines are a bit more gallop than groove, with lots of nice tom-thrashing in concordance with the heavy atmosphere. She's a math-Neanderthal with those sticks, while also doing most of the singing; evil, cryptic, howling vocals. The Formless should be the house band for Land of the Lost; they could play for the Sleestaks, that monkey, the secretly wild dad and one of the dinosaurs, if you catch my drift. I can't sum them up any better than that, really; exactingly handcrafted bricks of the uncanny, punk style, delivered with a slight wink and hardly another word. Both things apply tight focus and rigid control to approach the sublime through a side door.